Not sure where that came from. Wouldn't you loose your runway preferences (RWYUSE) ? You could try it on your local. Only thing I can confirm I tested successfully is that parking.xml is no longer required for as long as you have a groundnet. I'm sure these parking.xml's were converted to ****.groundnet.xml's when the groundnet method was introduced, mind you we've had so many bad groundnets added since that maybe some of the old parkings are a better option despite the old data within the file. Not sure where that came from. where what came from? my question as to whether ground net files are replacing parking files? TBH, i was surprised to find the parking files had what looked to be the same format as the ground net files... if the EDDF/parking.xml file is the old good parking and only needs a few fixups, that could be used and moved to E/D/D/EDDF.groundnet.xml, couldn't it? if that is the one that was feared lost? BecOzIcan wrote in Mon May 14, 2018 9:58 am: Wouldn't you loose your runway preferences (RWYUSE) ? BecOzIcan wrote in Mon May 14, 2018 9:58 am: You could try it on your local. Only thing I can confirm I tested successfully is that parking.xml is no longer required for as long as you have a groundnet. right... the implied question, once i discovered parking.xml was the same as groundnet.xml, have we converted the parking.xml files over to groundnet.xmls and adjusted them as needed so the old ones can be removed... i don't know where rwyuse.xml is derived from but it could/should also be renamed to ICAO.rwyuse.xml and moved to terrasync, too, shouldn't it? i thought the message that was the solved would be the one to be ticked... i'm surprised it offers me the chance to tick my own starting post... but sure, just so it'll clear your list... i always use "New Posts" and never "Unsolved Posts"
gooneybird wrote in Tue May 15, 2018 10:49 am: I'm sure these parking.xml's were converted to ****.groundnet.xml's when the groundnet method was introduced, mind you we've had so many bad groundnets added since that maybe some of the old parkings are a better option despite the old data within the file. i have WED here and AFAIK it is operational... i don't know that i can do the old taxi editor thing, though... i'm just not sure what i need to do to get WED to show me an airport and existing ground net so i can work on the ground net and parking... maybe i should make another topic for that? if the EDDF/parking.xml file is the old good parking and only needs a few fixups, that could be used and moved to E/D/D/EDDF.groundnet.xml, couldn't it? if that is the one that was feared lost? It is and surprisingly it is still fairly accurate, it would be a good base to start from when you start updating it as there is a lot more parking (especially the south side) and a new runway been added since that groundnet was created. Can't be done, you can create a new groundnet in WED but you can't edit an existing one with it, for that you must use Taxidraw. Which ever way you do it you will have to use Taxidraw at some point in the process. Ok, that's the piece I was missing, never realized this is what had happened at the time but it makes a lot if sense. One benefit of this old location (lost now I guess) is that, given it if fitted under FGData, I can commit to it. Maybe an avenue to explore in terms of making groundnets available to the masses. 2. 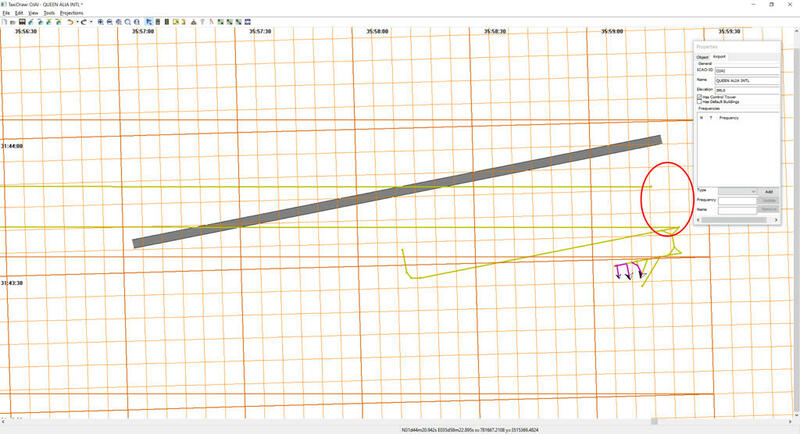 Add each route node (Centreline interesection) as a new Taxidraw node, using the lat / lon for the equivalent point in WED .
Notice the double grid (orange), like two reference systems are at play. I am not a developer so I could never resolve the source issue but if bringing TD into the 21st century is within the realm of your skills, you would make a lot of people -starting with me- very happy.